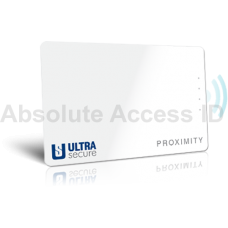 UltraSecure proximity cards offer a high quality, reliable alternative for your access control needs. The UltraSecure proximity cards are optimized for desktop printing and allow organizations to provide top level security in both physical and logical access. They will seamlessly integrate with your existing system by HID, Lenel, GE and others without the need to replace readers, panels or software. Choose from Wiegand or SMA Proximity, MIFARE, UHF, contact-chip (ICC) and dual technology cards, each with a secure read/write microprocessor. The SMA Proximity allows you to upgrade any proximity system to a highly secure encrypted communication without having to replace control panels of software. The SMA (secure, mutual authentication) uses proprietary encryption to keep your access control data secure while preventing sniffing and cloning. SMA cards and readers allow each customer to create and set up their very own proprietary and unique encrypted key allowing for the very highest security for your business or organization. Contact our sales team if you are interested in learning more about this technology and how it can benefit your business. We will gladly provide free test cards or samples with no obligation prior to purchase. The UltraSecure ISO-PVC proximity card features a quality surface optimized for photo ID printing. .. The UltraSecure ISO-PVC-MAG proximity card features a quality surface optimized for photo ID printin.. The UltraSecure ISO-PET proximity card features a quality surface optimized for photo ID printing. .. The UltraSecure ISO-PET-MAG proximity card features a quality surface optimized for photo ID printin.. The UltraSecure CLM proximity card is a clamshell card. This card offers more durability and can be..